Usually a bathroom is the least impressive room in the house. When guests come over, most people do not pay attention to the decor, or the bathroom countertop in that matter. But that is not the case with our product. 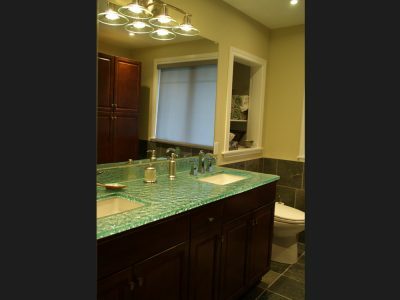 CBD Glass will make sure your bathroom countertop is one of a kind! 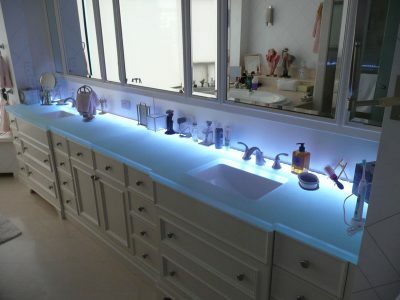 Your guests will be mesmerised by the outstanding beauty of the glass countertop in your bathroom. 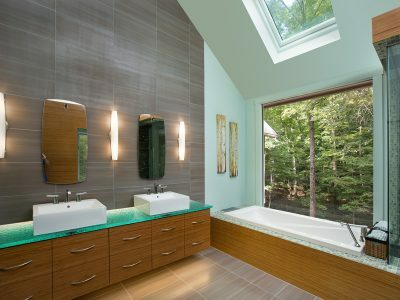 The most popular choice for bathroom countertops is the “Melting Ice” texture. The reason behind it is that “Melting Ice” usually goes with any interior; therefore, it is the most popular choice when it comes to textures. 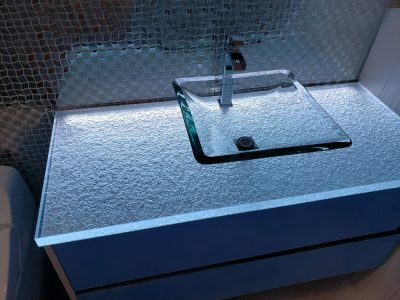 “Melting Ice”, combined with LED lights creates a “water” theme, which is perfect for the bathroom. To have a lighter look, use Ultra Clear glass with LED cool-white added. 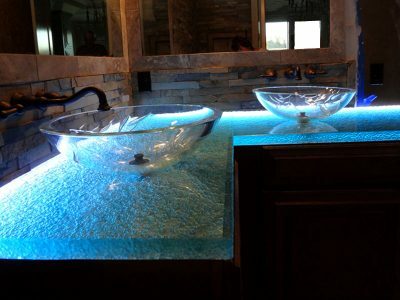 To have a more blue, ocean feel, use Aqua Clear glass with cool-white LED. If you desire a more natural look, without any dramatic effect, CBD Glass will also be able to accommodate you. By using the Ultra Clear glass, with minimum texture, or none at all, you can create a simple, chic, natural bathroom countertop. The glass will naturally blend in with any desired design. 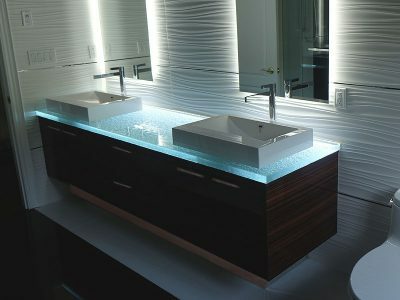 You can also combine our glass bathroom countertop with one of our glass vessels to complete the look. Please review our “vessels” page in order to see some options. 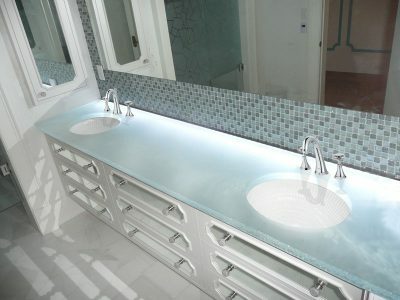 Bathroom glass countertop can also be backpainted, as you can see in some of our pictures. The greatest thing about this option is the fact that you can chose one of unique colors that CBD Glass has to offer, or any color off Benjamin Moore’s chart. 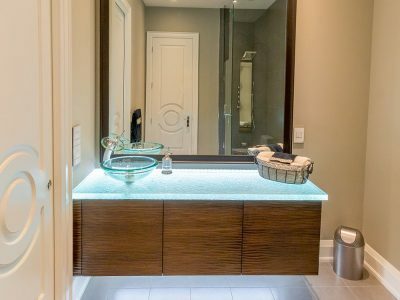 This gives our customers an option to create their unique countertop, no matter what color palette they choose for their bathroom, powder room, or guest bathroom.